It does. My commiserations on not being able to attend, and my thanks for letting me know. All the play mats have now gone! See everybody on Friday, if not before. Dinner for Villains tonight! We're locked in to 9pm even if he L5R tournament runs long. We'll be heading over at around 8.45 from the FFG tournament area, or you can make your way there yourselves - just let them know you're there for the Dinner for Villains/Spider dinner. If you have ordered a play mat, I'll have it with me. If you haven't already paid, please either bring $20 along or contact me for PayPal details. False advertising. No Mark. That's twice you've stood me up. This time for more than an hour. I will decide my vengeance and it shall be swift and terrible. My apologies to Paul and everyone else - I genuinely struggled with the dilemma of leaving the L5R tournament to come over, but it ran massively over, and I needed to win my seventh round in order to get a guaranteed place at Worlds. It certainly sounds like everyone had a great time! If you get chance, please fill in the form I've linked to below offering comments for B-Dubs - the location is Indianapolis Downtown. Sarah and her team really take care of us, and I'd like to make sure their corporate office knows that. Thank you very much to Geoff Prugh for helping make sure things ran smoothly without me there, and to David Gordon for his extremely kind and awesome gift. 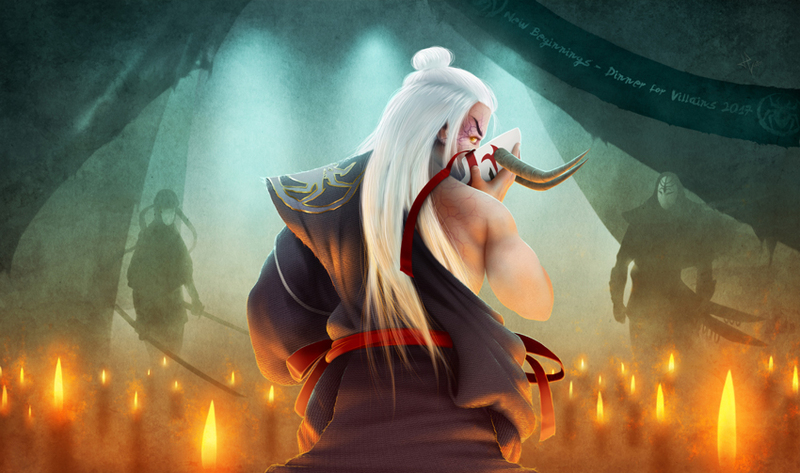 On a tangent, there's also a second link below: one of our own, Jason Pere, is attending the L5R Honored event in London, traveling from the US. Jason is a talented author, and actually used a Spider fiction to earn his place in this prestigious event. Attending is an expensive proposition, so please consider donating to his GoFundMe page - anything at all will help! One last thing to close out on this year's Dinner. I try and get everything done for the Dinner well in advance...we had our reservation locked down six months before the convention, and I'd spoken to both Hector (who is my go-to artist) and Drew Baker, who kindly prints up the play mats for us and transports them to GenCon, around the same time. However, life got very complicated, and I didn't chase up on things anywhere near as much as I should have, and we actually entered the week before GenCon with things still not finalized. This is where Hector and Drew came through big time for us. The amazing artwork you saw on the play mat was done with scant guidance from me in TWO DAYS by Hector, and Drew printed them right before the convention. That both were willing to offer this level of aid is amazing, and I'd like to extend to my heartfelt thanks to both. Drew is a staple at conventions and big events around the US - if you get chance, pop over and see him, buy some amazing artwork, and enjoy the company of one of the nicest people you'll ever meet. Hector is a little farther afield, but if you get chance and you've enjoyed any of the incredible pieces he's done for us through the years, please drop him a line at terekjet@gmail.com and let him know - he'd really appreciate hearing from people. With that, on to planning next year's Dinner!